Hello, I am glad you stopped by for a visit. On this page you will find links for all kinds of game not just deer and fish. I grew up with all the men in my family being hunters. I myself mostly just fish, but I do help clean and prepare all kinds of game. We are very lucky that we live in a rural area and there is always something to eat. We have deer, turkey, squirrel, rabbit, and on and on. I am not trying to offend anyone with this page, this is part of our everyday living. I see nothing wrong with hunting, the only gripe i have is that you EAT WHAT YOU KILL. I have never agreed with killing just for the so called thrill of it. So enjoy these pages and try something different every now and then. If you have never tried squirrel or rabbit stew, or a deer roast and brown gravy you don't know what you are missing. Before you leave please sign my guestbook and let me know that you were here. A must see! Packed full of Information. 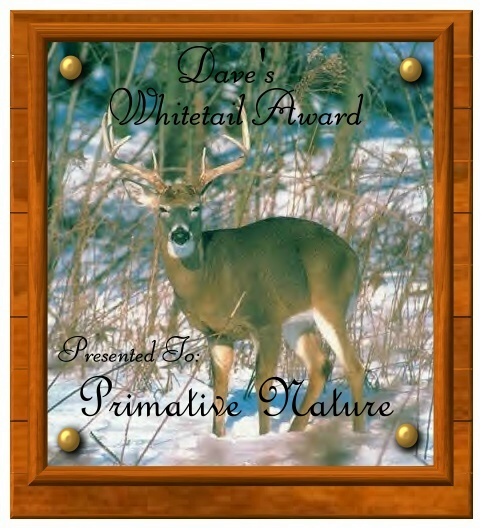 Check out the FANTASTIC hunting pics!! Rat has missed nothing! Go see his pages sign his book and tell him primitivenature said hi! Please sign my guestbook, if ones not working try the other one.